Lauras Finding the best backconnect proxies for you is as simple as can be. Powerful proxies from Microleaves, the world’s largest proxy network, will be able to handle all of your traffic with the utmost ease. Read on to find out all about reverse of backconnect proxies and how they can help you to enjoy a better experience online. First things first, what is a proxy? A proxy server is another computer that stands in for your computer. All of your web traffic will then be routed through the proxy, which becomes a hub for your computer’s activity. Whenever you send a request via your computer, it is rerouted through the proxy instead. Another way to think about this issue is to envisage a direct link between your computer and websites that you visit. When you browse the web without a proxy, you experience this direct link between your laptop, phone or computer and whichever websites you are looking at online. When you have a proxy server, on the other hand, the proxy breaks up this direct link. It sits in the middle, between your computer and the websites that you are visiting. If anyone were to try and find out your IP address, they would not find out the IP address of your actual computer, but rather of the proxy. Finding the best backconnect proxies is thus an excellent way to enhance your experience online. Why do people use proxies? Why not just use your own computer? There are numerous reasons why a web user might wish to use a proxy. The simplest explanation is that they wish to remain anonymous online. There are other reasons, however, why somebody might wish to use a Microleaves proxy service. One is that a powerful proxy server will enable a computer user to handle larger amounts of traffic than a regular computer – and to handle them more quickly too. Another reason is that if your proxy server is located in a different country, this will enable you to browse the internet as if you actually physically were in that country, sitting at a computer there and browsing the web. This is immensely useful if, for instance, you wish to watch TV shows online that are only available in certain countries. A backconnect proxy is a specific type of proxy. In many ways, it is very similar to a regular proxy, and when you use a backconnect proxy, you most probably will not notice much difference between the way it works and the way that regular proxies work. However, there are significant differences and in general, the best backconnect proxies will work better than your average run of the mill proxy server. The main difference is that with a regular proxy, you have just one proxy screening you from direct links to sites, and rerouting your traffic. A backconnect proxy, however, consists of a ‘swarm’ of numerous proxies. The number of proxies in a swarm can be anything from a couple of dozens to tens of thousands. This is similar to the way in which Tor works, and it is why the best backconnect proxies give you a different set of advantages. Why can it be better to use backconnect proxies? Backconnect proxies keep you more secure, and more anonymous too. Think about it. When you just have a single proxy server hooked up to your computer, it will always reroute your data in one, single way. You will send a request ‘A’ to your proxy and it will change it to ‘B’ every time. Though this does provide some degree of protection, it nevertheless is not totally impossible for more savvy internet users to track what proxy you are using and then trace your requests back to your original computer. All they need to do is to spot this regular pattern of rerouted ‘B’ requests and then work backward to work out what ‘A’ is. Some proxy users try and evade this by having a set of ‘rotating’ proxies, i.e. using one proxy for 10 minutes and another for 10 minutes before returning to the first proxy. Again, whilst this does provide a modicum of protection, all that it takes is for a savvy web user to latch on to the pattern of rotation and your proxy will become less secure. With a backconnect proxy, however, you will not have to face this issue. This is because the best backconnect proxies will reroute your requests in a different manner with every single request. Send request A the first time and it will be rerouted as B. Send it the second time and it will be rerouted as X. Send it a third time and it will be rerouted as M. The larger the swarm, the more permutations there will be. This makes it virtually impossible for anyone to find out the IP address of your computer, or track your web browsing. Of course, you may have to pay more for the best backconnect proxies, but they get the job done. Many companies use reverse proxies as it hides the internal structure of their system and protects them from hacking. Backconnect proxies also offer a speedier alternative both to classic proxies and to regular proxy free browsing. One thing that they speed up is SSL connections, which can help to make your web browsing experience more secure. Depending on what proxy package you opt for, there will be other specific benefits to your business. 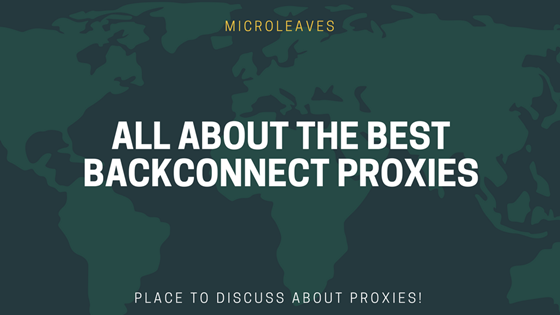 At Microleaves, you will find a superb selection of the very best reverse proxies in the world. These proxies are great for businesses and for private individuals alike. So, if you value your security and your anonymity online, it is highly recommended that you get yourself a reverse proxy from them today. These proxies are a step above your traditional proxies, and as such, they are definitely suitable for advanced web users. They can be used by anyone who wants them, however. So, get ready to enjoy the power of the swarm! Browse proxy options and select the best backconnect proxy for your needs today. You will have it up and running in no time.